Bush beans give a lot of bang for the buck. Pole beans may produce beans over a longer period of time, but they are slow to get started. Bush beans are ready to harvest in about one month of planting time. These compact plants offer an incredibly high yield and by planting them in a series of successive rows or blocks, you can have a continuous supply of beans throughout the growing season. By mid-summer, pole beans are starting to look tired. Even if you've been succession planting bush beans, you may be wondering if it's too late or too hot to keep trying in August. Fall-grown beans actually seem more tender and flavorful. Maybe it's the milder weather. If you've got about two months of frost-free or frost-protected weather, you can still grow another crop of beans. 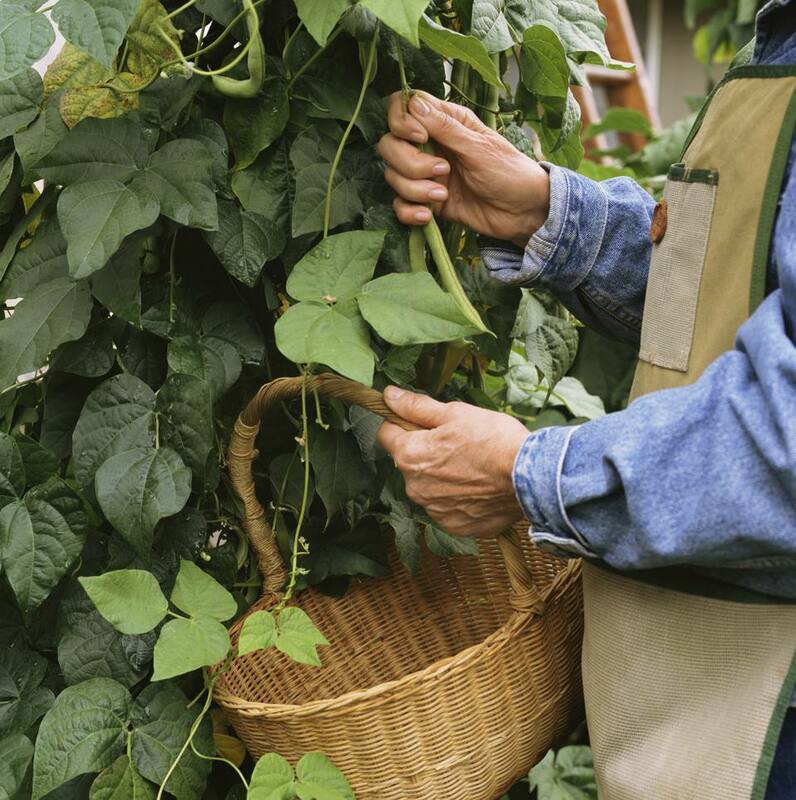 Grow a bush bean that matures in about 45 days. If you have bean seeds left over from spring, they are still good to use. There are also probably still seed packs available in the garden center. At this time of year, they should be on sale. Amend the soil with compost or composted manure, even if you already did so in the spring. You want to give your fall crop a good, quick start. A half inch layer of compost worked into the soil, should do it. These beans are going to take off and will need a rich soil to feed them and retain water as they grow. Water the soil before planting the beans. Soak it thoroughly. Having the bean seed on a moist bed will not only speed germination, it will cool the soil in the heat of the summer. Many seeds will not germinate if they think growing conditions are too hot. If you're planting in Zone 8 or above, add a layer of loose mulch. An inch of shredded straw will keep the soil cool, but allow the bean seedlings to emerge. Initially, the temperatures will be hotter than beans prefer. Compensate with regular watering. Let the soil dry out between waterings, so the seeds do not rot, but don't let it remain dry for more than a day. Keep a vigilant eye for pests and disease. There are more pests in the area in fall and they are finding less succulent new plants to feast on, so your beans would be an easy target. If the weather turns cold before you harvest, protect your beans at night with a row cover. You can also use a woven fabric, plastic, newspapers, or old sheets. Just be sure to remove the covering in the morning, so your beans do not fry when the temperature warms up. Pick your beans young and tender. If the weather cooperates, your bean plants will keep producing until killed by frost. Why stop with beans? There are plenty of other vegetables to grow in your fall garden too. You could be harvesting for the holidays.